A recent John McKern letter to the editor regarding the four Lower Snake River dams contained what I believe to be misleading and false information -- his fish claims for example. McKern stated juvenile salmon survival, presumably through the hydrosystem, exceeds 95 percent. Not true. The Fish Passage Center estimates wild Chinook salmon smolt survival over the past 10 years has averaged 52 percent. Wild steelhead survival rate is worse: 46 percent. 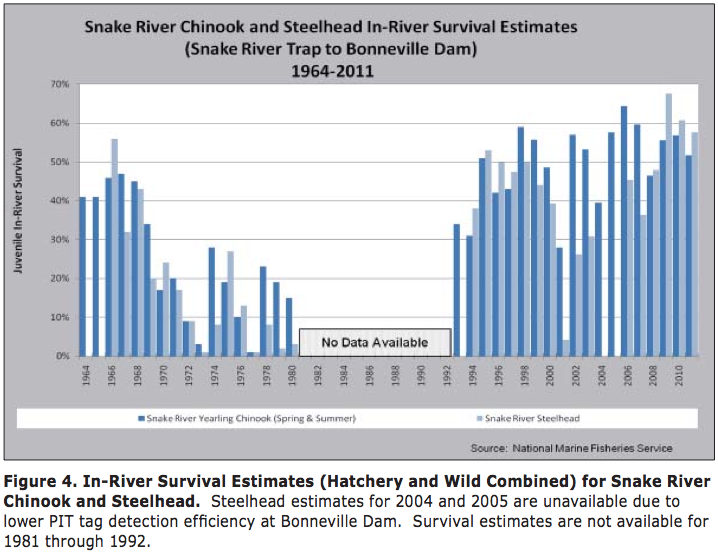 Wild Chinook survival rate in 1999 was .59 percent, in 2012 it was .57 percent. The U.S. Army Corps of Engineers' Walla Walla District has now spent $700 million on "system improvements" on McNary and the four Lower Snake River dams to improve smolt passage, but NOAA Fisheries recently acknowledged "Chinook survival through the hydropower system has remained relatively stable since 1999 with the exception of lower estimates in 2001 and 2004." Essentially, that means "no improvement" -- despite $700 million ... and despite increased spill. McKern also spoke of adult survival past the dams. He neglected noting that to keep Snake River threatened and endangered wild fish from extinction, we need a smolt-to-adult return ratio of at least 1 percent, with species recovery requiring an SAR of 2 percent-6 percent. The SAR for Chinook salmon over the past 18 years has averaged .59 percent, and never surpassed .8 percent. At least 1 percent is needed to avoid extinction. The Union-Bulletin accurately printed McKern's comments under "opinions," since they surely didn't reflect facts. However, McKern got one thing right: When convinced of your beliefs, no facts or truth will convince you otherwise.